When we first announced Papa’s Cupcakeria, we showed Seasonal Toppings, which is a huge addition to the series. What we didn’t discuss is that the toppings wont be the only things changing with the seasons. As you play, you will notice your shop and the surrounding town changing with the seasons. The snow will melt away and leaves will start to grow on the trees. As you work your way up the ranks, you will travel through Winter, Spring, Summer, and Autumn. Throughout that time, you will also see how the town celebrates the 12 Holidays in the game! What are the 12 holidays you ask? Well you’ll just have to play and see them all. Some of them are familiar, while others are unique holidays that the town enjoys celebrating. But don’t worry, the festivities don’t stop at the door! Each holiday will have special wallpapers, flooring, posters and furniture. Your customers will surely enjoy a lobby decked out for the current holiday! 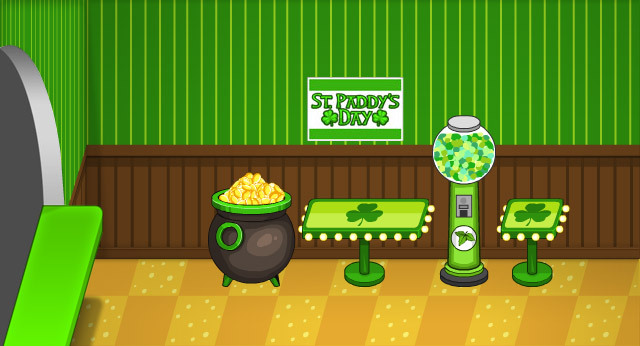 Here is just a sampling of St. Paddy’s Day furniture. Stay tuned for more sneak peeks of Papa’s Cupcakeria! ← The Winners of Papa’s Next Chefs 2013!